Green beans, fresh or steamed, are dog-friendly snacks. Adding vegetables to your dog’s menu is a simple task. Most veggies are well-suited to the canine tummy. Start with small amounts and, through taste tests, match the veggies in your kitchen to your buddy’s palate. Vegetables make year-round healthy snacks, treats and kibble toppers. Offer your dog a raw green bean, a zucchini slice or a celery stick. If the dog yums it up and wags for more, add the veggie to your dog’s approval list. When you fix a salad, toss a handful of salad greens such as lettuce, cabbage or romaine in the dog bowl. Scatter kibble over the greens and add diced chicken or flaked tuna. In the summer, slice summer squash and offer a bite to the dog. 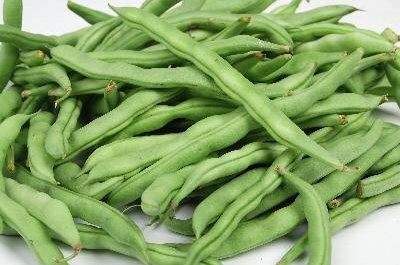 Check the refrigerator for snap beans or edible pod peas and test your dog’s taste buds. If your dog refuses or spits the food out, just leave that veggie off the "likes" list. Look for frozen vegetables such as carrots, green beans or peas. Choose plain vegetables with no salt, seasoning or sauces. In hot weather, your panting pup may roll over and do tricks for a tongue-cooling frozen green bean or carrot slice. Frozen vegetables thaw quickly for treats or homemade doggie meals. Ask your vet about using frozen green beans or carrots for teething puppies; chilled vegetables soothe and massage inflamed gums. Microwave or cook vegetables like beans, winter squash or broccoli until they are tender: Your dog’s digestive system may not tolerate fresh crunchy vegetables as well as steamed or boiled veggies. A finicky dog may reject raw produce. When your dog turns up his nose at garden-fresh fare, cook a cup of sliced carrots or green beans with a touch of chicken broth, then mix the cooled veggies into kibble. When your dog likes a vegetable but cannot easily chew or digest it, puree the vegetable like baby food. Or mash cooked vegetables into a soft treat. Your dog’s teeth will miss out on the crunchy veggie scrub, but the body benefits from the vitamins and minerals. As a dessert treat, open a can of pureed plain pumpkin, not pumpkin pie filling, and put a dollop in the bowl. On a cool day, blend split peas with water and slow-simmer to a smooth soup. This high-protein, low-fat meal is a tummy warmer for both people and pooches. Freeze leftovers in small portions for your dog as a chilled tummy-soother or kibble-topper. Purina: Do Dogs Really Enjoy Eating Vegetables? Are Vegetables Okay for Boston Terriers? What Vegetables Are Healthy for Yorkies?